MLNP: Scene Sundays Sept 27th!! 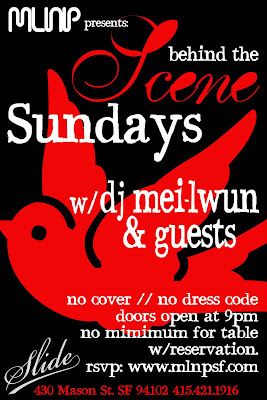 Scene Sundays this weeks special guest Dj David Carvalho joins MLNP's resident Dj Mei-Lwun for house anthems and new remixes. Hosted by Nadia Patel this week will be fun and funky. If you havent already become and MLNP VIP at our blog, download mixes and check out some party pics.